Shivneri FortHeight : 3500 ft.
Junnar means “Jirna Nagar”, one of the oldest cities of ancient India. The Shaka dynasty ruled here. Gautamiputra Satkarni, who was a Satvaahan king, defeated the Shakas to establish his rule. The era of Satvaahan is the most glorious one, as many artistic works were carried out during their rule. Junnar became their capital city. This was the golden era of our culture. Here more than 100 caves were carved out in the mountains surrounding Junnar. The mountain on which fortification was constructed, is well protected by steep scarps, and is the most suitable for constructing caves. Here 64 caves were carved, and eight inscriptions are found here. It was named Shivneri. After Satvaahans, the fort went into the hands of Yadavas, and then to the Bahmani Kings. The Bahmanis put a hindrance to the trade between north and southern India. After the death of Malik-ul-Tujar, Malik Ahmed, the son of first Nizam Malik Hasan, claimed himself to be the ruler and established Nizamshahi. Jadhavrao (father of Jijamata) accompanied Jijamata to Shivneri with a cavalry of 500. Shivaji Maharaj was born in 1630 when Shahaji Maharaj was in a distress. Shivaji Maharaj left this fort in 1632 and it went into the hands of Mughals in 1637. In 1650 the local fishermen refuted against them. The folks lost to the rulers and were assassinated cruelly on the fort. In 1678 the Marathas raided Junnar, but attempt to capture Shivneri was futile. Shahu Maharaj brought the fort under his control forty years later. Later it was under the control of Peshwas. The fort has a significant shape, like an arrowhead, pointing towards the north. Someone has described this as an arrow pointing towards the tyrant Moguls of north, threatening about Shivaji Maharaj. It is surrounded by about 7-8 forts in the region, and was built to guard the city of Junnar and the ancient route of Naneghat. From the top of the fort we can have a view of Lenyadri, a famous pilgrimage and the Giant Meteoric Radio Telescopes of Narayangaon. This is the place on the fort where the birth of Shivaji Maharaj took place. This place is named as Shiv Mandir. Ahead of Shiv Mandir there is a huge water tank. This is the place where prisoners were punished by throwing them down the fort. This point is on the northern end of the fort. In front of Shiv Kunj on can see this Kamani Masjid. It might have been named Kamani because the top of this structure is like bow that is called as Kaman in Hindi. On the east-facing wall there is an inscription in Urdu. These are the water cisterns behind the Shiv Kunj. Water in these cisterns is potable. On whole of Shivneri there are more than 10 water tanks. This monument is built in the place where Mughals killed thousands of Koli soldiers in the year 1650. Every fort needs to have a warehouse for its storage of grains and food products. Ambarkhana is the place where huge amount of grain can be stored. The caretakers here keep this place very clean. To reach on fort Shivneri first we have to reach Junnar. Distance between Junnar Bus stand and Shivneri is 2 km by road. 1) From Mumbai or Kalyan one can reach Junnar via Malshej Ghat or via Khandala Ghat. Route via Malshej Ghat is the preferable as it takes less time. Buses ply hourly from Kalyan towards Junnar. Distance from Mumbai is approximately 100 km. 2) From Pune or Shivaji Nagar one can take buses for Junnar. Buses ply hourly for Junnar from these bus stands. One can also descend at any one of these diversions and use local transport to reach Junnar city. 1) A 2 km walk from Junnar bus stand takes us to the foothills of Shivneri, right up to the steps. This route is the main one, through 7 magnificent doors. On this side is the temple of Goddess Shivai. Shivaji was named after the name of the deity. This is situated in the place where stands the cave carved by the Buddhists during the Satvaahan era. To the right of the temple are few more caves. On the walls of second cave is an inscription. Two more are found on the walls of neighboring caves. 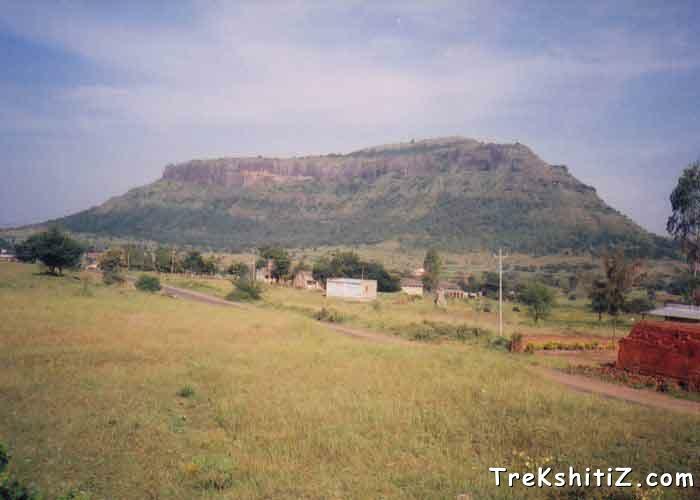 In all there are 64 caves carved in the walls of mountain on which Shivneri is built. Many people traverse through this route, as it is very easy. 2) Second route to climb this fort is to ascend from the eastern face. This route is little tiring. From this route it hardly takes 1 hour to reach at the top from the base stand. On the way there is a temple of Hanuman. One has to take a path on the right side of the temple. This small path takes us to the reserved forest. In this forest there lays the path to reach to top. One has to be careful, as there are many paths that can mislead us. Traversing upwards for 20 minutes takes us to the rock cut caves on the eastern side of the fort. On the left we can see steps running upwards. After ascending this steps we can reach top in 10 minutes. One can make a stay on the fort in Shiv Kunj or Ambarkhana. Shiv Kunj is a suitable option among the two because of water cisterns is available near it. 1 hour from base village.